Historically, magnetic confinement developed at the dawn of fusion work (in the 1950s) was not based on the tokamak reactors just described: plasma was simply confined between two symmetrical, high B regions. In between these two regions, diverging B field lines shape a sort of magnetic "sausage", pinched at the two ends by higher B (see Figure B.6). Plasma particles must therefore spiral along the B field lines, moving either way towards the two ends; under the right conditions, in their back and forth motion they periodically convert their translation into spinning (rotation) energy: ideally, they reach either end with very high gyration frequency and no translational energy at all. It is this zero-translation condition at either end that forces particles to turn back, spiraling in the direction opposite to that they came from. So, the B field acts as a "mirror", reflecting charged particles back and forth between the two high-B end regions. By designing the B field properly, plasma can be confined long enough to absorb the ignition energy injected from outside, and to start fusing. 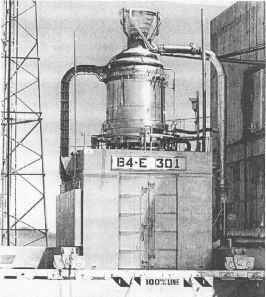 Once ignited, feeding the reactor with fuel will keep it operating steadily. This ideal and simplistic picture is actually far richer in important details; for instance, electrons are lighter than ions, and tend to leak at both mirror ends; the ratio between the low and the high B in the "sausage" is critical and must be kept above a certain value; and many others (see Appendix B). A comprehensive review of mirror fusion devices and of their features and problems is that by [Post, 1987]; this review is 20 years old because interest in this approach for terrestrial power has not been as great as that in other concepts. Nevertheless, mirror fusion seems one of the promising technologies for rocket application. Here attention is focused only on the MCF aspects more closely related to propulsion, while an extensive discussion of its plasma confinement and reactivity issues is in Appendix B. Once fuel fuses and generates energy, a mirror-configured MCF can become a fusion rocket: this is done by "leaking" plasma from one of the mirror's ends and letting it escape into a magnetic nozzle. In other words, B can be made unsymme-trical: then, if the plasma residence time allows the fuel enough time to fuse, adjusting B at one end lets the plasma escape, at a controlled rate, with all its high kinetic energy (speed) and momentum, creating thrust. Inert propellant may be added to increase thrust, but not inside the reactor chamber proper, on pain of quenching. Mixing between inert and fusion products must be done in the nozzle, as shown for instance in Figure 8.9. The B field can be shaped to confine and guide the plasma just as solid walls confine the hot gas in a chemical rocket nozzle. A critical issue in designs to maximize thrust is that the rotational velocity component of the plasma particles as they go through the nozzle must be converted as much as possible into an axial component: spinning does not contribute to net momentum change (thrust). This is a goal that poses not a few problems to designers of magnetic nozzles.